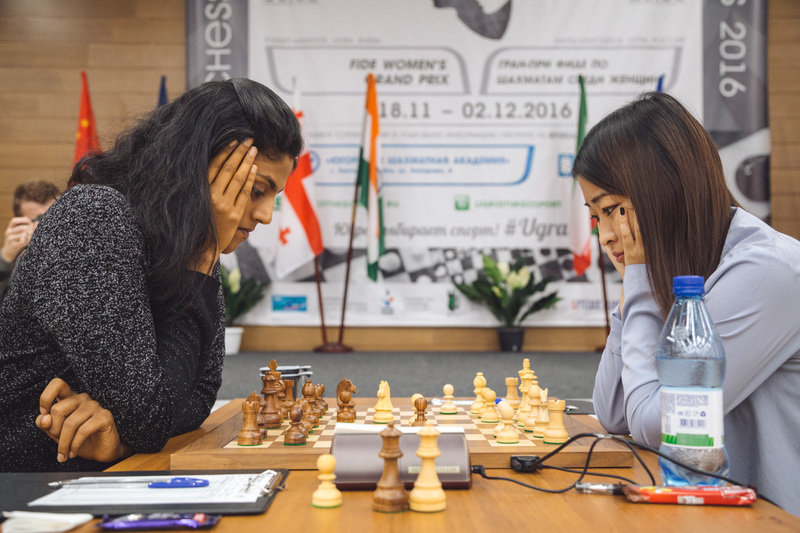 After the rest day, the players resumed fighting with new energy, but nevertheless the 5th round turned out to be one of the most peaceful affairs so far. Only Nino Batsiashvili and Bela Khotenashvili, who had visited the hockey match on a rest day, were successful today. Nino Batsiashvili recovered after the 4th round’s loss having won against Almira Skripchenko and thus grabbing the sole lead again. Almira chose quite a rare opening line with Black, but Nino was well prepared and managed to gain initiative right from the start. “I didn’t get out of the opening”, – said Skripchenko at the press conference. White got a straightforward attack on the kingside, while both kings were left at the center. 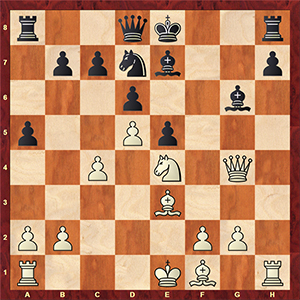 It was a rather difficult task for Black to defend herself, and Almira missed one beautiful strike from White as well. Nino was very precise in converting her advantage, while Black found herself in a kind of a zugzwang. 21. Ng5 c5 22. Be6 Bxg5 23. Bxg5 Qc7 24. a4 b6. 25. Ra3, and Black resigned. A convincing victory for Nino Batsiashvili. 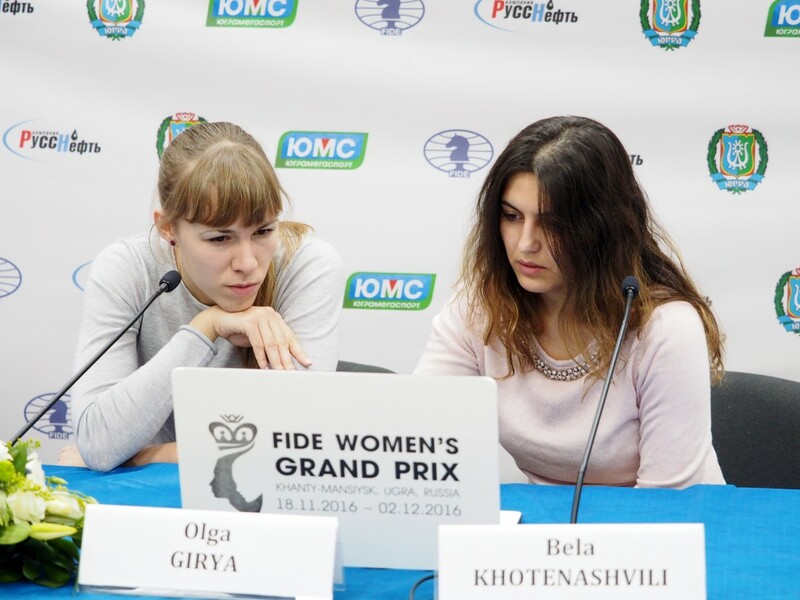 Bela Khotenashvili won her first game in the tournament, against Olga Girya, while the latter suffered her first defeat. In the Gruenfeld Defense White (according to Olga) forgot the lines and was fighting for the equality. But Black’s precise and energetic actions on the queenside were too hard to beat off, and after the exchanges White lost a pawn and then didn’t manage to survive in the endgame with different color bishops. All other games were drawn. 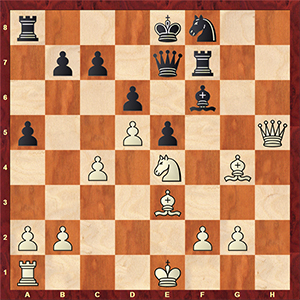 Ju Wenjun and Dronavalli Harika played the Catalan Opening, where Black put into effect an interesting plan. White responded quite logically and later on chose the line, which eventually led to a threefold repetition. A draw was agreed at the 19th move. 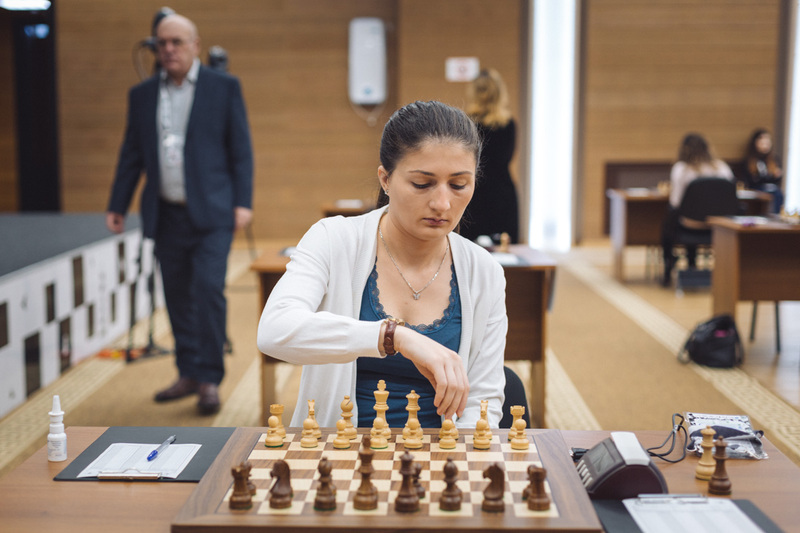 In the Russian derby Pogonina-Gunina the former improved her play from the game against Humpy Koneru (Rhodes, 2013), changed the plan and got a very comfortable position with White. Black started a pawn advance on the queenside, which was firmly met by the White’s counterattack in the center, and Natalija achieved a solid edge. 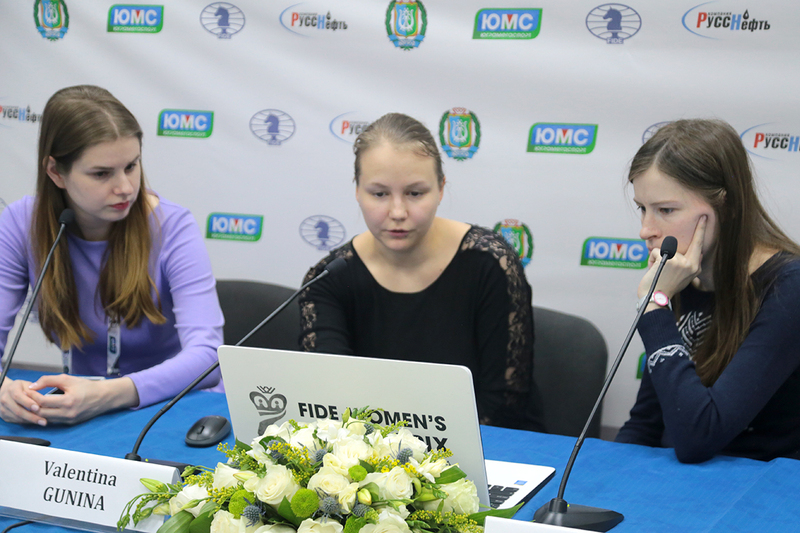 But, having spent much time in the middlegame, Pogonina didn’t manage to make the most of it and, at some point, allowed Gunina to equalize and escape. 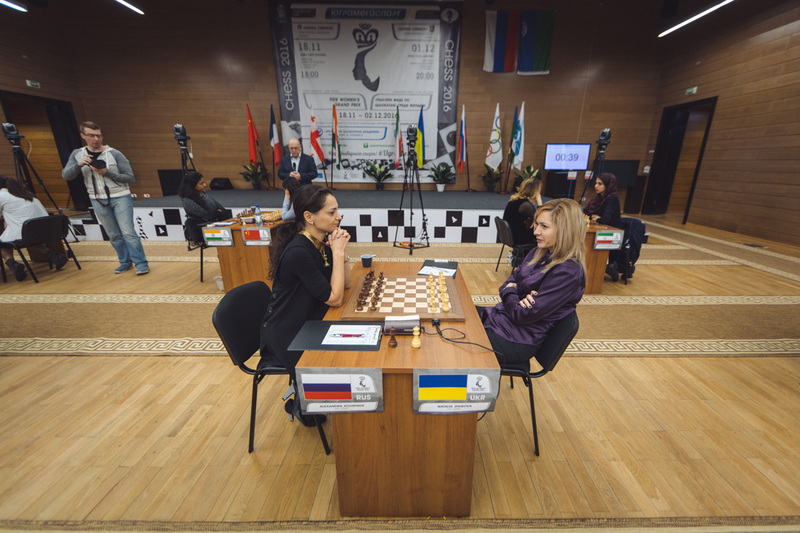 Natalia Zhukova chose the Trompowsky Attack with White against Alexandra Kosteniuk. The game turned out to be a very interesting battle, with many lines to be calculated. White castled long, while black king’s position wasn’t determined almost till the end of the game. Both sides were acting rather precisely in mutual complications, and then many exchanges followed. The draw was agreed in an equal rook endgame with almost all the pawns left. 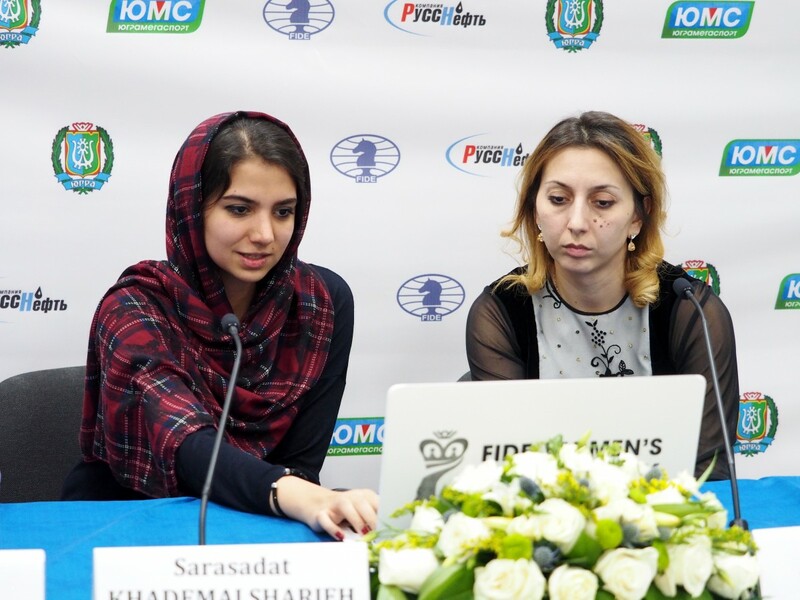 Quite a calm game was played by Sarasadat Khademalsharieh and Lela Javakhishvili in the Queen’s Gambit Declined. Although a certain advantage was on the White’s side, still Black’s position stayed very solid, and Sarasadat decided not to squeeze water from stone trying to break Black’s castle, and the draw followed at the 40th move. Current standings of the whole GP Series are making Ju Wenjun happy: at the moment, she is the leader. But Valentina Gunina is breathing down her neck. 1. Nino Batsiashvili – 4, 2. Valentina Gunina – 3,5, 3-5. Sarasadat Khademalsharieh, Ju Wenjun, Olga Girya – 3, 6-7. Alexandra Kosteniuk, Dronavalli Harika – 2,5, 8-10. Natalija Pogonina, Natalia Zhukova, Bela Khotenashvili – 2, 11. Almira Skripchenko – 1,5, 12. Lela Javakhishvili – 1.